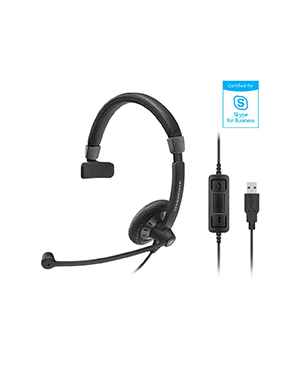 Sennheiser SC 40 USB MS Black Wired Headset is a single-sided wired headset that has been certified for Skype for Business use, making it perfect for business and professional usage. 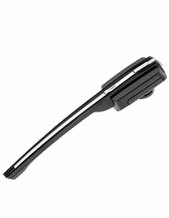 It has a refined style and design, along with comfortable instant fit and top-notch audio quality. 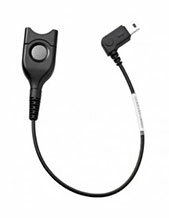 Sennheiser SC 40 USB MS Black Wired Headset has an in-line call control unit structured to contribute to better call handling and management. With this control unit, a range of call management functions and features are right on hand. Some of these functions include Call Answer/End, Volume Control, Microphone Mute, and Call Redial, which can all be accessed directly from the headset. Get to know this incredible headset better by calling us through our hotline: Australia wide 1300 131 133! Sennheiser Electronic GmbH & Co. KG is a privately managed German enterprise recognised to be one of the leading companies in the audio electronics industry. The company specialises in the designing and development of high fidelity audio products and solutions, including microphones and headphones. Headquartered in Wedemark, Germany, Sennheiser is powered by the leadership of CEO and Chairman of the Board Daniel Sennheiser and the support of approximately 2,183 employed experts. Other factors that help in the company’s operates are its company partners and subsidiaries all over the world. One of its reliable subsidiaries is the Georg Neumann. Sennheiser has always strongly envisioned a society empowered by high quality innovative audio products and solutions. It aims to be able to provide a culture of innovation to its entire company and in the process to the entire market. This is also the reason why the company has become the very definition of audio electronics innovation in the industry. Headsetsonline Pty Ltd is one of Australia’s biggest online stores offering wide selection of audio and music products and solutions. This Australia-owned and –operated enterprise is part of a popular company that delivers high quality headsets and headphones for corporate agencies and government sectors. This has been going on since the year 1998 and from there has excellently provided the market with wide selection of speakerphones, headphones, and headsets. More than these tangible products, the company also offers incredible services to support the operation of these products. 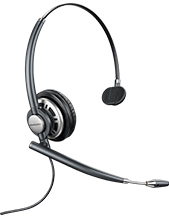 Headsetsonline operates in the online market through its secured and enterprise-encrypted website Headsetsonline.com.au. The site uses green URL address bar and HTTPS, which in itself means that the site is incredibly secured. It also has the GeoTrust True Business ID with Extended Validation that even adds to the protection of the entire site. In addition of that, it uses the same security log-in of banks, which helps in protecting customers in their online shopping.